886 FDC LIECHTENSTEIN - 1995 / 2009, extensive collection of beautiful illustrated First Day Cover, packed in a carton, mainly on SAFE-leaf, as well numerous special- and commemorative sets, many nice motives and so on. Very large number of pieces and enormous subscription price! 976 ✉ LIECHTENSTEIN - extensive inventory from covers, postal stationery and First Day Cover packed in a carton. Many nice documents, including Rhine need 1928 on registered cover, further nice frankings, registered, illustrated First Day Cover to to the year 2010 and so on. Favorable! 1014 / 1/3x LIECHTENSTEIN - clean lot in the stockbook with useful issues, with also Michel no. 1/3 x, Rhine need 1928 and further issues. Favorable! 1056 1/3x, Mi. € LIECHTENSTEIN - 1912 / 98, very nice and cultivated mint never hinged collection in four safe hingeless printed form ring binder with numerous high-value issues. Also the issue prince Johann 1912 on chalky paper (Michel no. 1/3 x, Michel 1000,- €), 10 U (Michel 600,- €), national coat of arms 1921 close perforated (Michel 460,- €), landscapes 1921 (Michel 1000,- €), postal stamps 1924 (Michel 260,- €), government building 1925 (Michel 360,- €), prince Johann II. 1925 (Michel 260,- €), Rhine need 1928 (Michel 340,- €), accession to power 1929 (Michel 200,- €), Zeppelin series 1931 with photo certificate Marxer BPP (Michel 700,- €), child care 1932 with photo expertize Marxer BPP (Michel 220,- €), birthday series 1933 with photo expertize Marxer BPP (Michel 250,- €), postal stamps 1934 (Michel 300,- €), airmail 1934 (Michel 300,- €), Zeppelin series 1936 (Michel 260,- €), postal stamps 1937 (Michel 140,- €) as well the post-war period nearly complete including good sets from the forties and fifties, castle from Vaduz, Vaduz souvenir sheet 1949, painting series, as well subsequent still a nice part official stamps. A wonderful quality object with very high catalogue value! 1104 literature LIECHTENSTEIN - Michel special catalogue 2017 / 18, original price 42,- €. 1132 / 1/3, 255/58 LIECHTENSTEIN - 1912 / 90, nice and rich collection clean formed in the hingeless illustrated album with plenty of better issues. With also Michel no. 1 / 3, numerous further issues, special- and commemorative sets, issues the thirties and forties. The postwar years from 1945 / 90 are except for Michel no. 255 / 58 in the number of a major listing complete available and were almost exclusively mint never hinged formed. A very nice object! 1223 LIECHTENSTEIN - 1945 / 2005, very nice and cultivated mint never hinged collection, complete with all issued stamps in two Michel hingeless printed form ring binder with all good issues from the forties and fifties including aviation pioneer 1948 / 50, paintings set 1949, Vaduz souvenir sheet 1949, Prince and Princess, postal stamps 1951, paintings sets, prince from Vaduz 1952, Prince and Princess 1955, the post valid issues and so on. A very nice quality object! 1276 LIECHTENSTEIN - 1988 / 2009, mint never hinged collection complete in the beautiful Michel album with mounts with all special- and commemorative sets, souvenir sheets and so on. High face value! 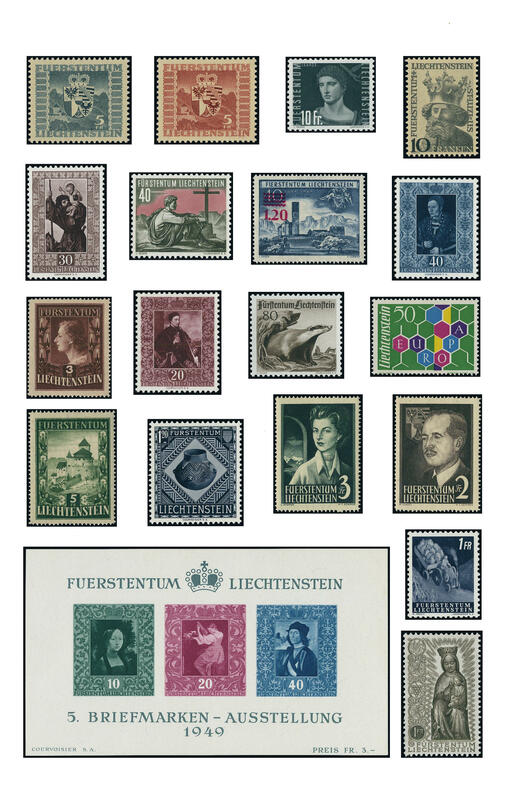 1384 /⊙/ 1/3x, 1/3y LIECHTENSTEIN - 1912 / 92, nice collection in two hingeless album formed. Also the first issue on white paper from 1912 (Michel no. 1/3 x), as well once again on normal paper (Michel no. 1/3 y), airmail set 1930, many special- and commemorative sets and so on. 1418 / 140/42, 304/05A und LIECHTENSTEIN - 1912 / 94, very nice collection, in the number of a major listing complete with all issued stamps in two Lindner T hingeless printed form ring binder with many rarely issues right up to the key values. 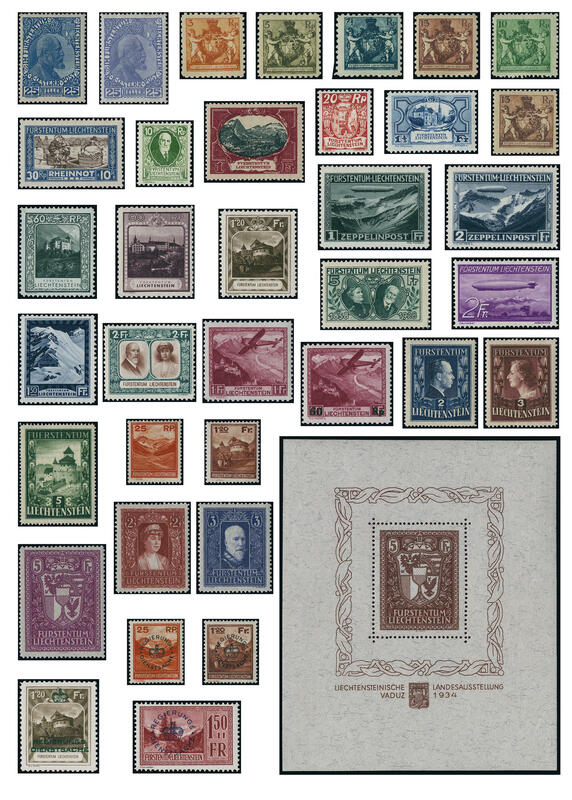 Also the issue 1912 complete in both paper types (25 lighter with all three values), postage stamps set 1921 in both perforations, throne ascent 1928, postage stamps set 1930, Zeppelin series 1931, postal stamps 1933, Vaduz souvenir sheet 1934, postage stamps set 1933 (Michel no. 140 / 42) and all further issues, with also Prince and Princess 1951 in close and further perforation (Michel no. 304 / 05 A and 304 / 05 B), as well also the official stamps in the number of a major listing complete including Michel no. 1 / 8. A very nice and Cultivated object, which an extensive part mint never hinged issues includes. Cultivated collection with very high catalogue value! 1439 /⊙/ LIECHTENSTEIN - 1917 / 2005, rich collection in two ring binder formed, mainly mint never hinged and used, very few unused. As well better issues as for instance Rhine need 1928, airmail, aviation pioneer 1948 mint never hinged, Vaduz souvenir sheet 1949 with first day special cancel, paintings set 1949 mint never hinged, 5 Fr. Castle from Vaduz 1952 used, Prince and Princess used, as well further better issues, postal valid values and so on. Michel approximate 4000,- €. 1466 ✉ 01. Mrz LIECHTENSTEIN - very interesting and rich collection from covers and cards with many beautiful documents in four ring binder. As well an interesting cover from 1838 with content to Vaduz used, nice pre philately letter with two line cancel \"VADUZ\", decorative frankings, as well Michel no. 1/3 on registered postcard, Rhine need 1928 on card to Switzerland used, lovely documents from the thirties, the forties well represented, airmail, as well scarce documents with sought-after flights and frankings and so on. A magnificent object with substance! 1530 xeF LIECHTENSTEIN - huge inventory in four moving boxes accommodated, as well a great many novelties to approximate 2010 including miniature sheet, centric cancellation issues, numerous covers, First Day Cover and so on, without postal valid issues. Also a beautiful special subscription from \"ring the LIECHTENSTEIN collector\" is included. Furthermore also a collection machine cancel in the card box and so on. A gigantic amount of material with gigantic acquisition price! 1578 ✉ LIECHTENSTEIN - interesting collection from covers and postal stationery with useful documents in the letter album. As well a nice part older picture post postal stationery with sought-after issues, different subjects, views, registered covers from the thirties and forties years including better frankings and so on. A magnificent object! 1594 LIECHTENSTEIN - 1970 / 92, complete mint never hinged collection with all issued stamps in the thick Lindner T hingeless printed form ring binder. Additional are still a few miniature sheet including 20 Fr. Country patron 1979 included. Enormously post price respectively catalogue value. Original price of the album already approximate 120,- Euro. 1595 LIECHTENSTEIN - 1966 / 95, nice mint never hinged collection, complete with all issued stamps in two claret Lindner T hingeless printed form ring binder. Very high post price respectively catalogue value. Original price the albums already approximate 200,- Euro. 1603 /⊙/ /✉ LIECHTENSTEIN - extensive inventory in two large stock books and a ring binder accommodated with lots of material. As well older values, numerous special- and commemorative issues, partly close one above the other puted, complete sets, miniature sheet and so on. Huge catalogue value! 1630 ⊙ LIECHTENSTEIN - 1960 / 2001, nice used collection in the spring back binder with numerous different issues. Also the Europe stamp 1960 used and once again on the large adornment sheet margin neat cancelled, numerous complete sets and so on. Very high purchase price! 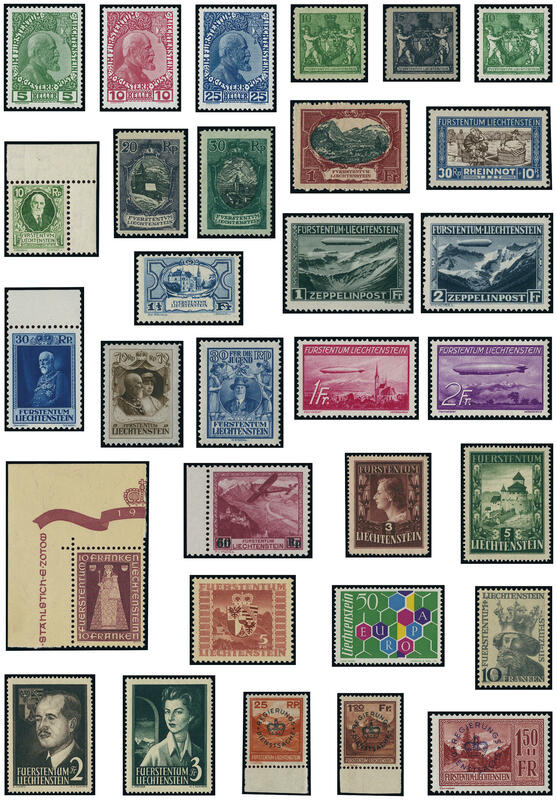 1637 LIECHTENSTEIN - 1975 / 95, extensive mint never hinged collection from miniature sheet in the ring binder, as well numerous complete sets, nice motives, also coronation Mantle and so on. Post price approximate 1800,- Sfr. 1665 LIECHTENSTEIN - 1956 / 2011, complete mint never hinged collection with all issued stamps, clean and maintained in two Lindner ring binder. As well a considerable portion postal valid issues. Very nice object!